There was a time when reggae music was all over Cebu City. Even until now, rasta vibrations are still present downtown. If you listen good enough, not a day passes by without coming across the familiar stirrings of Buffalo Soldier. Arguably, Cebuanos are by nature laid back island dwellers and it doesnt come as a surprise that we easily adopted as our own the vibes that came all the way from Kingston, Jamaica. Although Bob Marley may be the poster boy for reggae, Inner Circle is without a doubt a Cebuano favorite that is on anyone's reggae playlist. I, for one, have never stepped out of a beach party or town disco without bouncing crazy to Sweat (A Lala Long) and Bad Boys. A true blooded Sugbuanon like me cannot resist to dancing to authentic reggae music as played by reggae royalty, Inner Circle, themselves! Cebu will be on an early festive mood come November 6! The last reggae event happened in the same place with Big Mountain. Im loving The Monastery with their consistent commitment to feel-good vibes! 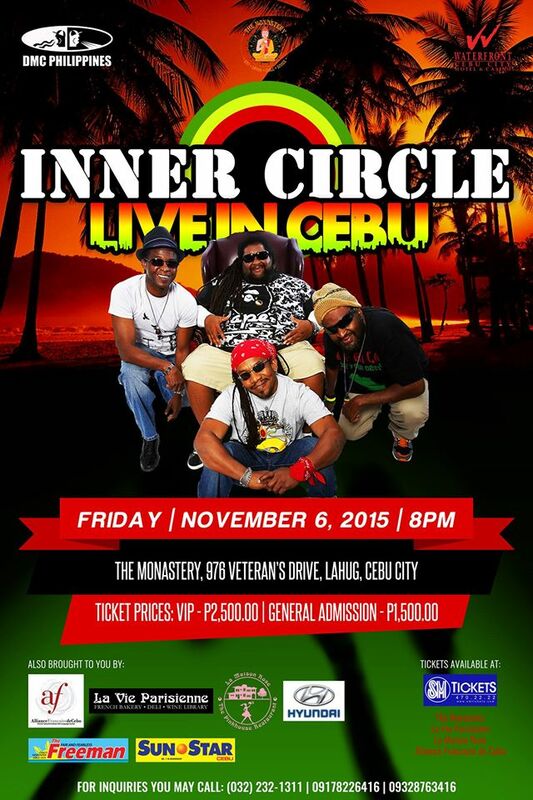 The Monastery brings us the bad boys of reggae, Inner Circle live in Cebu for their One Love Reggae Revolution Tour. The event is presented by DMC Philippines in cooperation with Waterfront Cebu City Hotel & Casino and The Monastery. Ticket prices: VIP - Php2,500.00 | General Admission - Php1,500.00 available at any SM Tickets outlets, The Monastery, La Vie Parisienne, La Maison Rose (The Pink House Restaurant), Alliance Francais de Cebu. This event is also brought to you by: La Vie Parisienne | La Maison Rose (The Pink House Restaurant) | Alliance Francais de Cebu | Hyundai Cebu | The Freeman | Sunstar Daily. For inquiries you may call: (032) 232 1311 | 09178226416 | 09328763416.